The Department of the Environment and Natural Resources is considering biological warfare against an invasion of knife fish in Laguna Lake. 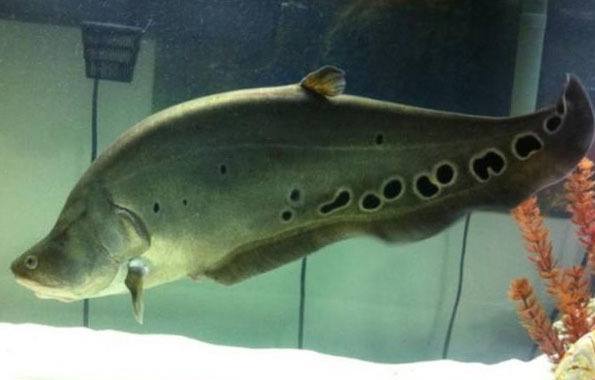 The knife fish “an ornamental BUT carnivorous species”, has been terrorizing fisherfolk in Laguna de Bay by eating up their tilapia and milk fish and threatening them with low harvests. Also, by looking like this. 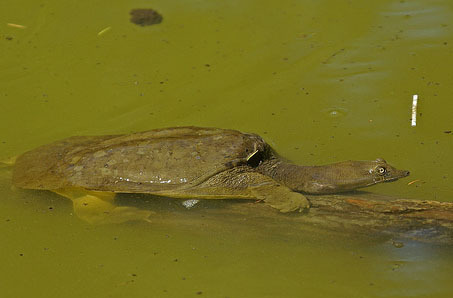 One proposed solution is releasing soft-shelled turtles into the lake to eat up knife fish eggs. Isidro Mercado, DENR provincial officer, came up with the suggestion when they learned that the turtles (Pelodiscus sinensis) feed on the eggs of the knife fish. He said the turtles, although considered “predators,” would not pose harm to marine species growing in the lake since they do not eat fish. “We think these (soft-shelled turtles) could be a possible solution, although we are still conducting further researches to determine its characteristics,” Mercado said. The Bureau of Fisheries and Aquatic Resources has warned against introducing foreign species into Laguna de Bay without first studying how that will affect the lake. “In the case of Taal Lake, the fishermen complain about these turtles because they bite off and destroy the fish nets,” Leah Villanueva, chief of the BFAR Inland Fisheries Research Station said. Should the release of knife-fish-killing turtles go awry, the DENR has a back-up platoon of turtle-eating crocodiles in reserve and ready for deployment. And if the batch of turtle eating crocodiles suddenly cause an overpopulation, there’s always a bunch of people willing to capture it to make a lechon out of it! PERFECT! ^ Heh. Governance, man. It’s not so hard. As an erstwhile biologist I can’t help but recall that whole experience with escargot.